Product #15704 | SKU MMMINI | 0.0 (no ratings yet) Thanks for your rating! 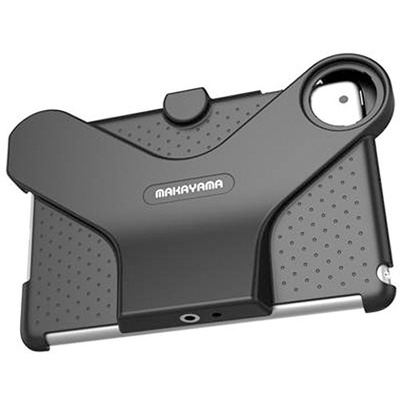 The Makayama Movie Mount for iPad mini enables you to shoot high-quality movies using your iPad mini. The iPad mini is one of the few devices that not only allow you to shoot high-definition videos, but also edit and upload them to the web. However, maintaining stable shots during long schedules becomes radically difficult without a sturdy support to mount your iPad mini. The Movie Mount overcomes this problem by allowing your iPad mini to be fixed upright and be used as an efficient movie maker. And, the 9° working angle gives you better positioning while editing your shots. This versatile Movie Mount can be fixed onto a tripod (sold separately) for when you require stable shots or pan / tilt movement. It also allows you to conveniently switch between your iPad mini’s built-in lens and optional tele and wide-angled conversion lenses on-the-fly. Additionally, its cold shoe mount can accommodate a hook-up light, a microphone, or an optical viewfinder (all sold separately). This Movie Mount also comes with a Movie Mount iPad app that can be installed onto your Apple device to manually control your video recording. Note! Lenses, tripod, microphone, and lights are not included. Comes with standard screw fitting. Adapter cable for shotgun microphone sold separately. * Lenses, if required, need to be purchased separately.